NEWS ALERT . . . Pam bought a Thermos. I repeat, Pam bought a Thermos. OK, I guess that won’t make the news, because I buy Thermoses left and right, but isn’t she pretty. And shiny. And the Delta railroad lantern is pretty darn cute too! I haven’t done a lot of thrifting finds posts in the last six months or so, because honestly, I need to figure out what to do with some of the stuff I have in my house before I start bringing other things into it. I hit the thrifting wall. I use most of my thrifting finds to decorate my home. I find it gives the house a quirkiness factor that you just can’t find at HomeGoods or Target (although Target does have their cool stuff). And what’s life without a little quirk. So I’ll use something, let’s say a funky green 1937 Royal typewriter, for a few months and absolutely love it. LOVE it! Then I will find something else while out thrifting that I can’t live without and would look fabulous where the typewriter is setting, so the beloved typewriter gets booted to the basement for a few months. The poor typewriter may make it out of the basement and back in the decor rotation again or it may just sit down there forgotten and forlorn. In either case, the mountain of thrifted vintage items continues to grow and grow. And grow. So until I either open a booth, set up a online shop or move to a mansion in the Hamptons, I’m going to have to limit my thrifting purchases. So anyhow, enough about why I’m buying less. Let’s get you caught up on what I have allowed myself to buy lately. 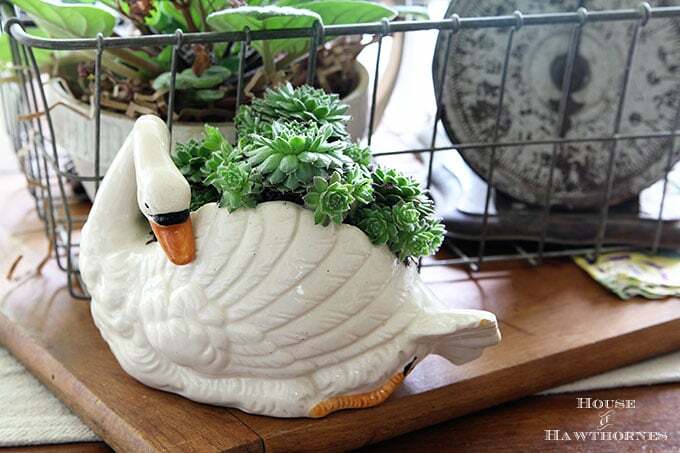 This swan planter was found in the basement of a church at their annual rummage sale. It was covered in dirt and grime and I almost didn’t buy it, because it looked really bad. But it was a quarter and I’ll basically buy anything for a quarter. Once I gave her a good bath and planted some succulents in her she got a new lease on life. Sort of like The Ugly Duckling story. I picked up some silverware for some crafting projects I have in my head. 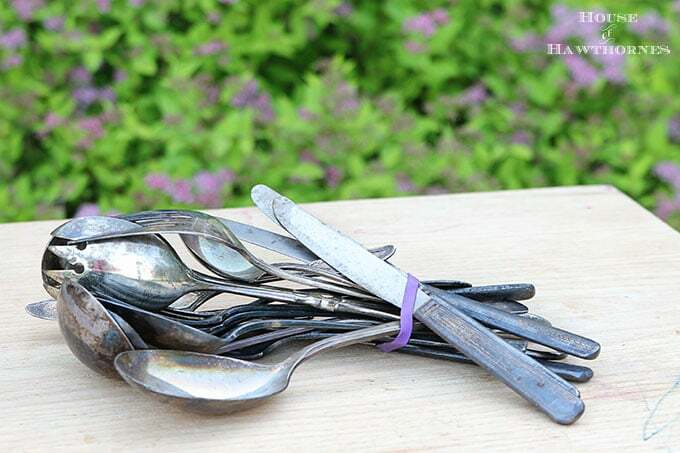 Now to just get them out of my head and actually make something with all this silverware. 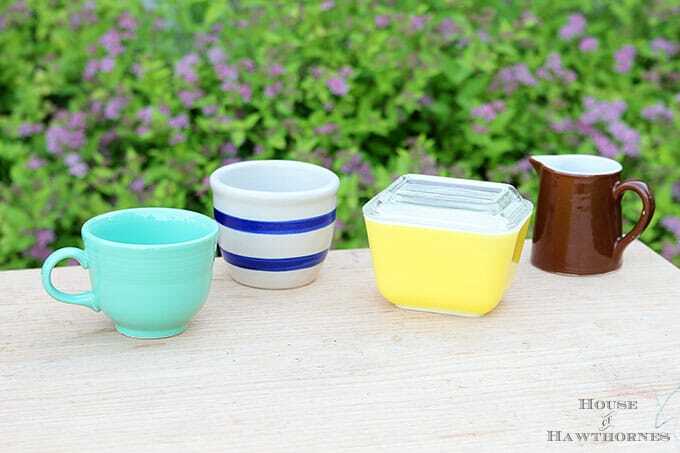 Left to right we have a a Fiestaware cup (from what I researched online, it’s most likely newer), a little Roseville pottery bowl, a yellow Pyrex container and a little brown syrup pitcher from Hall. I think the Hall pitcher was probably restaurantware. I don’t normally buy a lot of small kitchenware, but at 10 cents a piece I made an exception (breaking my own thrifting code there). 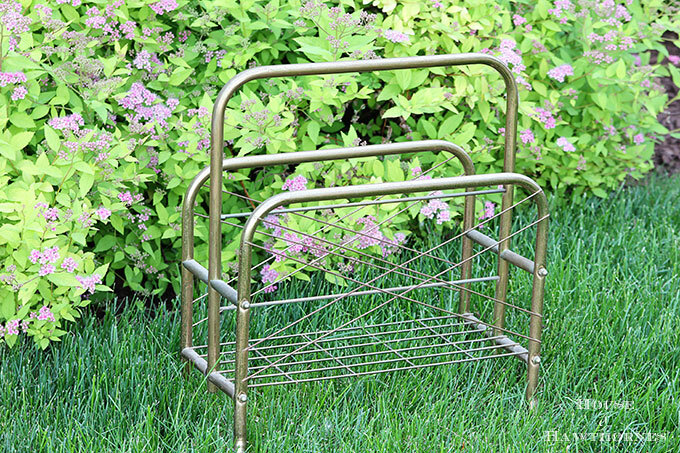 A brass magazine rack for who knows what. I had visions of painting it and planting flowers in it since the brass it pretty pitted. Or maybe get all wild and crazy and use it as a magazine rack. 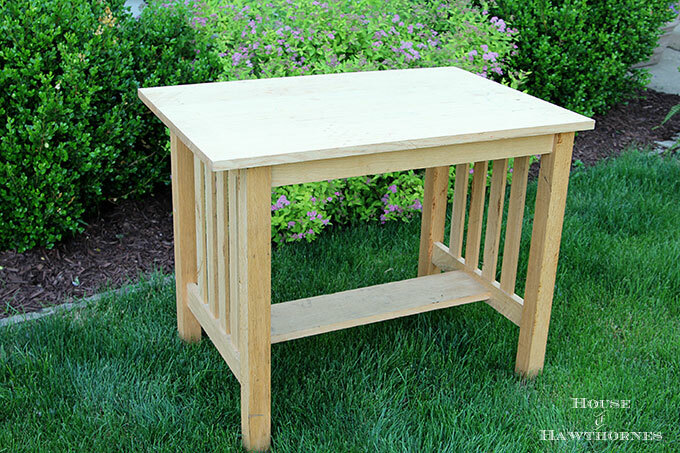 This Arts and Crafts style table was bought for $5. It looks like it’s a table that someone made in shop class and never completely finished. The top is not connected at all and never has been, but I have plans for this. Now let’s put the spotlight on you. Have you been thrifting and yard saling this summer? Do you feel that you ever come to a limit to how much you can thrift? That you have hit the wall? Or is the sky the limit? I haven’t been thrifting at all in a long time! I tend to spend my time and money at the yard sales during this time of year. But I have been doing a lot of re-donating to the thrifts to make room for more! 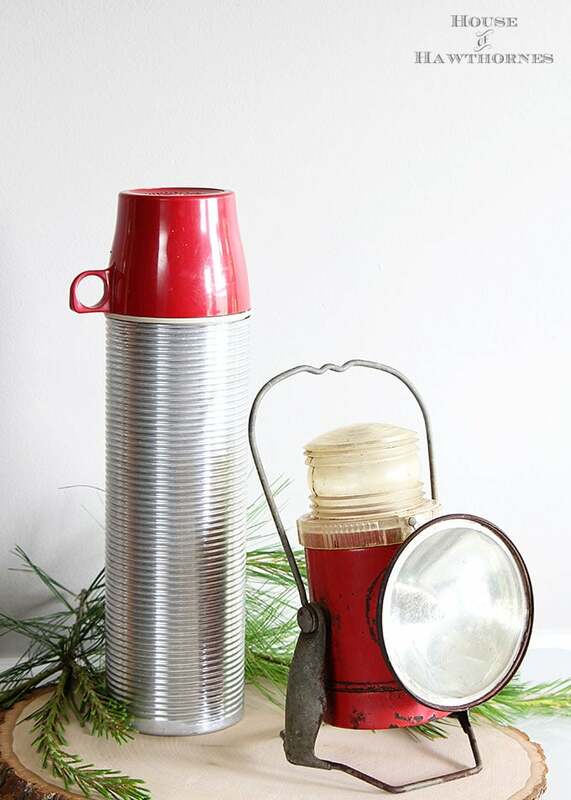 Love the Thermos. It looks so shiny and new. Was it ever used? I picked up one just like it at a garage sale recently without the lid thinking I’d make another lamp out of it for the guest room. I think it had been used, just because it seems to be missing some of the “cups” that hide in the lid. It’s one of those ones that came with a picnic set so it has that red lid with the handle to drink out of and then a couple cream colored handle-less cups. But only two, I think they came with three cream colored cups??? Luckily I have Etsy shops and a space at a local antique mall so I get to thrift to my little heart’s content and I just tell people “It’s to resell” if they give me any crap! Some of my finds though make it into my own home decor though but I still use the resell excuse! lol! I am at the same point. I think if I was more organized with my storage in the basement it would not be so bad. Maybe you have some ideas about that. Love your pictures. My BFF, who spent 30 years furnishing her home with her antiques and collections is downsizing and moving. Putting everything back into the world is even more work than acquiring it. I got rid of a lot when we downsized. Now the rule is for every piece that comes in, two have to leave! 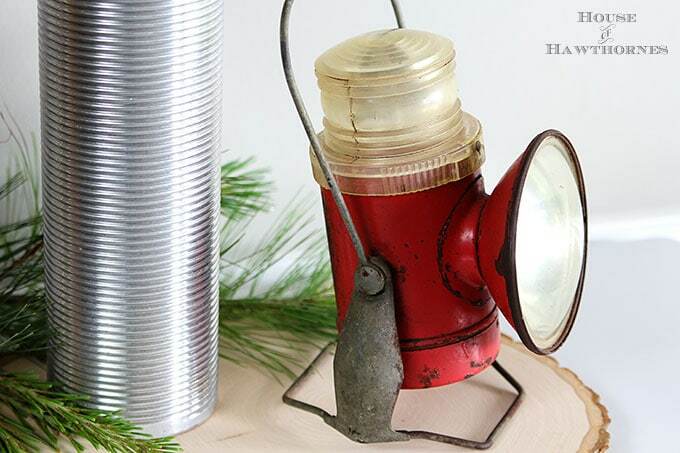 Love all of your finds – especially that lantern. Yes, I know exactly how you feel. I have got to start getting rid of some stuff soon. I am combining my belongings into my my parents home and their stuff! I love the hunt! And like you I’ll buy just about anything for a quarter. However my fiancé thinks it’s all just clutter and I am trying to cut back on how much stuff is on each table. I do like a more minimalist look but not quite sure how to manage that with my love for stuff. I have quit going to garage sales until I can find room by getting rid of some of the stuff here. Took three carloads to church sale, feels good to donate it. I’m not patient enough to have a sale. I may have to adopt the one thing in two things out practice. I have several old thermos up stairs that were the folks…may have to send you a picture..for your collection. Having the Aframe now gives me the perfect excuse to keep collecting. I really need to cut myself off at vintage holiday though. Great additions, Pam. That light is awesome and the thermos is in mint condition. I was just wondering how you were. I have been a little absent from reading posts but I reall was thinking of you. I used to make sure to hit every sale. I just let them come and go right bow. Trying to sell and get in a smaller place just dampens the searching bug. Maybe I will just hold our til the CL Fair. Hope you son I doing okay. I collect pyrex containers like the one you have shown. Love them. The swan is sweet. But I can not get over what a steal that Arts and Crafts style table was. Can’t wait to see how you finish it. Pam, I have tons of stuff but luckily I have 2 booth spaces to sell stuff so I can keep buying. But seriously if you ever get rid of your wonderful green typewriter, I want to be first in line to buy it. I have been wanting one like it ever since you posted the pics of it. Love love it. I love the stuff you did buy! And this is precisely why I have an Etsy shop, an Instagram shop and I sell at a few outdoor markets! I can’t stop the treasure hunting but I also don’t want to show up on Hoarders so this is the perfect solution. Catch & Release junking! I betcha if you had an instagram or blog sale you could unload some of your goodies to make room for more! I’m purposely not going to any markets at the moment because I maxed out! Something, many things need to go before I bring anything else home. I think my husband thought I was sick last weekend when I said ‘no thank you’ to a flea market offer! I have definitely been getting more into thrifting this summer! Always so much fun to hunt. As always you have the cutest displays Pam. I go thrifting every once in awhile. My knees are shot is one reason, but I don’t seem to be able to find anything worth bringing home. The last thing I brought home (several months ago) were two VanBriggle mugs, but I can’t seem to find enough information about them in order to sell them. Pricing them is very difficult. I’ll have to work on that again soon! I don’t seem to be interested or there isn’t anything interesting out there! I’m not sure which one. I really enjoy seeing what other people have found, but I don’t seem to have a need to find stuff for myself right now. I don’t want to buy just to buy. We may move at some point, and I don’t want to have to pack just STUFF. Let’s see how it goes when I want to decorate a new-to-me house! Maybe instead of not talking at all, maybe you can show us something new you have done with something you’ve had for awhile. You still have stories to tell, if you want to tell them. Maybe if you could tell us what you know about the items you collect, I’m sure we’d like to hear that. Or, maybe there’s something personal to share. If you’re busy, that’s ok, too. Do what works for you! And have fun doing it! Best wishes! I do know what you mean, Pam. I do like to purge and downsize and stay very conscious of the choices I make when thrifting but then other times I feel a if I am one sale away from appearing on a “Hoarders” episode!!! I just moved so I am giving myself permission to splurge a little. However, once I completely unpack and take inventory, the Etsy shop will be open!!! But….. great thermos!! !